I've been a bit absent as of late. I have still been painting my nails, but that's about it. I've not attempted nail art of any description and as pretty as the polishes are I've felt really uninspired. I've also had writers block. I'm going to take the pressure of myself, where I expected a blog post daily, instead I'm going to focus on doing a mani I like and writing about it. To be honest I'm just going to wing it, I hope that's ok with you? Anyway onto my current mani! I'd been in Boots recently and spotted Barry M Gellie - Grapefruit and thought "that's a lush colour I need to wear that again some time", so I did just that. I went home and put it on. That was on Friday night. Today when I am writing this is Sunday, that's new for me. 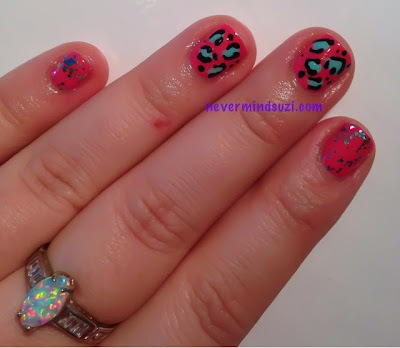 I decided I needed a "real" mani and I was going to stamp over it at first but then I went with what was closest to hand and that was some nail art pens so I decided to do some freehand leopard print on my accent nails and add glitter to the rest. The glitter I have used is Dollish Polish - Is This A Kissing Book? which was from Dolly's "The Princess Bride" collection. A clear base with pink, blue and gold glitters. Some of the pinks have a lovely holo effect and there are gold diamonds too. It felt good doing this mani so long may it continue!